Witches Protection Program by Michael Phillip Cash finds Wes Rockville confronted with the last thing he expected: witches. After Wes has failed to transport one prisoner, he's given one last chance to prove himself and save his career. His father sends him to the Witches Protection Program to work with Alastair Verne. His first assignment is to investigate a cosmetic company's upcoming release of Pendragon Glow face cream, which turns out to be a witch's sinister plan of a global takeover. Wes isn't sure how much he believes in witches until he's tasked with protecting the cosmetic company heiress, Morgan Pendragon, who happens to have a few spells up her sleeve. Michael Phillip Cash has a sharp humor, often drawing it out of action moments, and through Wes as he learns about witches and magic. Wes is the outcast of his perfect family, not quite living up to what his brother has accomplished, so he's sent to this secret program to find a place for himself. Alastair has been at the job a while so he has all the answers and brings Wes into this hidden world of magic and spells, good and evil. Morgan knows there's something going on with the glow cream that her aunt hasn't shared, but she's also loyal and has a deep understanding of right and wrong. She's very strong-willed and is anything but a damsel in distress, which makes her so likable. 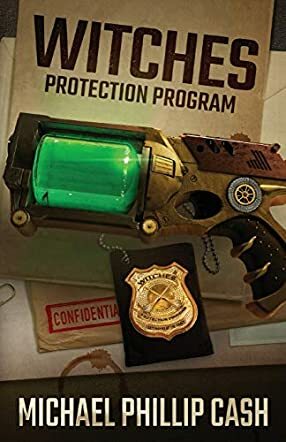 Witches Protection Program is a unique gem, one that's fast-paced with twists, action, and fun characters.